Thirty commemorative US stamps (not including Champion of Liberty Issues) were issued between 1957 and 1958, making an average output of about fifteen commemorative stamp issues per year. Many of the stamps, issued during his period, celebrate or honor contemporary events, in addition to historical anniversaries. The Champion of Liberty Issues, due to the large number of these commemorative US stamps, are not included in this site category's "Commemoratives" pages. They will be described in their own page in this site category, called "Champion of Liberty Issues of 1957-1961". The 3 C. denomination stamp shown above, at the left (Sc. #1086), was issued on January 11, 1957 to commemorate the 200th Anniversary of the Birth of Alexander Hamilton. The design of these US stamps features a portrait of Alexander Hamilton, along with Federal Hall in New York City. Federal Hall was the first capitol building of the United States and the location of George Washington's inauguration as the First President of the United States. Alexander Hamilton was one of the Founding Fathers of the United States, being an officer during the American Revolution, a strong supporter of the new constitution, the founder of the U.S. financial system, and the founder of the Federalist Party. Hamilton was the first Secretary of the Treasury of the United States, serving from 1789 to 1795. Along with Benjamin Franklin, he is the only person pictured on modern U.S. banknotes (the $10 bill) that is NOT a former President of the United States. The 3 C. denomination stamp shown above, at the right (Sc. #1088), was issued on February 11, 1957 to celebrate the 150th Anniversary of the Coast and Geodetic Survey. The design features the flag of the Coast and Geodetic Survey, along with ships at sea. The 3 C. denomination stamp shown above, at the left (Sc. #1087), was issued on January 15, 1957 to honor those that helped in the Fight Against Polio and to commemorate the 25th Anniversary of the National Foundation for Infantile Paralysis and the March of Dimes. I have had a bit of trouble finding a description of this design. One online source says it's a "a nurse, a girl, and a boy". I was living back then, and I don't ever remember seeing a nurse wearing a cape over a full length toga and holding a shield. The Scott Catalog refers to the design of these US stamps as "allegory". If it is an allegory, I would prefer to think of this design as depicting Hygeia, the Roman goddess of health, cleanliness, and hygiene. Thus it would be "An Allegory of Hygeia Protecting the Children"! By 1957, Polio, at least in the United States, had almost been eradicated. This stamp was a sort of victory issue, celebrating that accomplishment. The 3 C. denomination stamp shown above, at the right (Sc. #1090), was issued on May 22, 1957 to celebrate the 100th Anniversary of the Steel Industry in America. The design features a steel pouring ladle. The 3 C. denomination stamp shown above, at the left (Sc. #1089), was issued on February 23, 1957 to commemorate the 100th Anniversary of the American Institute of Architects. The design features Corinthian and modern architectural columns. The 3 C. denomination stamp shown above, at the right (Sc. #1091), was issued on June 10, 1957 for the International Naval Review and the Jamestown Festival. The design features the Jamestown Festival emblem and an aircraft carrier. The 3 C. denomination stamp shown above, at the left (Sc. #1092), was issued on June 14, 1957 to celebrate the 50th Anniversary of Oklahoma Statehood. The design of these US stamps features a map of Oklahoma, an arrow, and an atom diagram, emblematic of the celebration slogan "From Arrows to Atoms". The 3 C. denomination stamp shown above, at the right (Sc. #1093), was issued on July 1, 1957 to honor the Teachers of America and to commemorate the 100th Anniversary of the National Education Association. The design features a teacher and two students looking at a globe. The 3 C. denomination stamp shown above, at the left (Sc. #1097), was issued on September 6, 1957 to celebrate the 200th Anniversary of the Birth of the Marquis de Lafayette. Marie-Joseph Paul Yves Roch Gilbert du Montier de Lafayette, Marquis de Lafayette (1757-1834) was a French aristocrat and military officer who fought for the United States in the American War of Independence, attaining the rank of Major General in the Continental Army. He commanded the French fleet at the Siege of Yorktown, which resulted in the surrender of the British forces and the end of the American War of Independence. The 3 C. denomination stamp shown above, at the right (Sc. #1098), was issued on November 22, 1957 to emphasize the importance of Wildlife Conservation in America. The design of these US stamps features two Whooping Cranes, with their offspring in the foreground. The 3 C. denomination stamp shown above, at the left (Sc. #1099), was issued on December 27, 1957 for the 300th Anniversary of the Flushing Remonstrance, the first document in early American history to address the principle of Religious Freedom. The design features the Bible, a hat, and a quill pen. The 3 C. denomination stamp shown above, at the right (Sc. #1100), was issued on March 15, 1958 to honor the Garden Clubs of America and to commemorate the 100th Anniversary of the Birth of Liberty Hyde Bailey (1858-1954), a botanist and horticulturist. The design of these US stamps features a representation of the "Bountiful Earth". The 4 C. denomination stamp shown above, at the left (Sc. #1094), was issued on July 4, 1957. The design features the 48-star U.S. Flag and the inscription, LONG MAY IT WAVE. The 3 C. denomination stamp shown above, at the right (Sc. #1104), was issued on April 17, 1958 to publicize the Opening of the Universal and International Exhibition at Brussels, Belgium on April 17, 1958. The design features a view of the U.S. Pavilion at the exhibition. The 3 C. denomination stamp shown above, at the left (Sc. #1106), was issued on May 11, 1958 to celebrate the 100th Anniversary of Minnesota Statehood. The design of these US stamps features a view of a lake in Minnesota. The State of Minnesota is known as "the land of 10,000 lakes". The name Minnesota, itself, is derived from the Dakota Indian word meaning "clear blue water". The 3 C. denomination stamp shown above, at the right (Sc. #1107), was issued on May 31, 1958 to publicize International Geophysical Year, which occurred during 1957 and 1958. The International Geophysical Year (IGY) was an international scientific project that lasted from July 1, 1957 to December 31, 1958. Sixty-seven countries participated. The IGY encompassed eleven earth sciences: aurora and air-glow, cosmic rays, geomagnetism, gravity, ionospheric physics, precision mapping, meteorology, oceanography, seismology, and solar activity. Significant results of these scientific projects were the launching of the first U.S. and Soviet Earth satellites, the discovery of the Van Allen radiation belts, and the discovery of mid-ocean ridges, providing an important confirmation of plate tectonics. The 3 C. denomination stamp shown above, at the left (Sc. #1108), was issued on June 12, 1958 to celebrate the 200th Anniversary of Gunston Hall and to honor George Mason, one of the Founding Fathers of the United States, the author of the Virginia Constitution, and the author of the Virginia Bill of Rights. The design of these US stamps features a view of Gunston Hall, the large Virginia plantation house built in 1755 by George Mason (1725-1792). The 4 C. denomination stamp shown above, at the right (Sc. #1112), was issued on August 15, 1958 to celebrate the 100th Anniversary of the Trans-Atlantic Cable, linking the Eastern and Western hemispheres. The design features the World globe, along with Neptune and a Mermaid. The 3 C. denomination stamp shown above, at the left (Sc. #1109), was issued on June 25, 1958 for the Dedication of the Mackinac Bridge, connecting the upper and lower peninsulas of the State of Michigan. The design features a view of the Mackinac Bridge. The 4 C. denomination stamp shown above, at the right (Sc. #1119), was issued on September 22, 1958 to honor Journalism and Freedom of the Press and to celebrate the 50th Anniversary of the first School of Journalism at the University of Missouri. The design features an early press and a hand holding a quill pen. 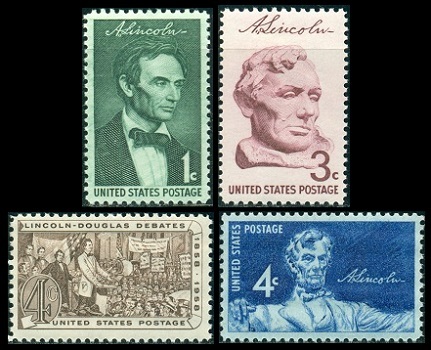 The Scott catalog calls the four US stamps shown above the Lincoln Sesquicentennial Issue, but that is not entirely true. The four commemorative US stamps shown above (Sc. #1113-16), featuring portraits of Abraham Lincoln (1809-1865) were actually issued, between 1958 and 1959, for three different historical anniversaries. The 1 C. (green) denomination was issued on February 12, 1959 to commemorate the 150th Anniversary of the Birth of Abraham Lincoln on February 12, 1809. The design is based on an 1860 portrait of Abraham Lincoln by George Peter Alexander Healy (1813-1894). The 3 C. (purple) denomination was issued on February 27, 1959 to commemorate the 100th Anniversary of the Founding of Cooper Union in 1859. The design features the 1908 bust of Abraham Lincoln by Gutzon Borglum (1867-1941), now in the United States Capitol. Cooper Union is a privately funded college for the advancement of science and art, located in Manhattan, New York City. On February 27, 1860, the school was the site of an important address by Republican Party candidate Abraham Lincoln. The address was widely reported in the press and distributed throughout the North, in pamphlet form. This address galvanized support for Lincoln and contributed to his gaining the Republican Party's nomination as their candidate for President of the United States. The 4 C. (sepia) denomination was issued on August 27, 1958 to commemorate the 100th Anniversary of the Lincoln - Douglass Debates. The design features Abraham Lincoln and Stephen A. Douglass (1813-1861) debating political issues, from the painting by Joseph Boggs Beale (1841-1926). The 4 C. (dark blue) denomination was issued on May 30, 1959 to commemorate the 150th Anniversary of the Birth of Abraham Lincoln. The design features a contemporary drawing of the Daniel Chester French statue of Abraham Lincoln, inside the Lincoln Memorial in Washington D.C. The 4 C. denomination stamp shown above, at the left (Sc. #1120), was issued on October 10, 1958 to celebrate the 100th Anniversary of Overland Mail. The design of these US stamps features a mail coach and a map of the Southwestern United States. The Butterfield Overland Mail Trail was a stagecoach service that operated between 1857 and 1861. The service carried passengers and mail from St. Louis, Missouri and Memphis, Tennessee, across the Southwestern United States, to San Francisco, California. The Overland Mail service was taken over by Wells Fargo & Co., and it became part of their overland express network. It took a very dedicated traveler in those days .... the 2,795 mile route, by stagecoach, took 596 hours, or about 25 days. The 4 C. denomination stamp shown above, at the right (Sc. #1123), was issued on November 25, 1958 to celebrate the 200th Anniversary of Fort Duquesne. The design of these US stamps is a montage, representing the capture of Fort Duquesne in 1758. At the center of the stamp is Virginia Militia Colonel George Washington. On his left is the wounded British General Forbes, being carried on a stretcher. Also shown is Colonel Henry Bouquet, the second in command to General Forbes. The other characters represent members of the Virginia Militia. Fort Duquesne was established by the French in 1754, during the Seven Years War or French and Indian War. It was located at the confluence of the Allegheny and the Monongahela rivers and controlled access to the Ohio river valley. In 1758, the fort was captured by the British. A new fort was built on the site, called Fort Pit. The area around the fort would eventually become the City of Pittsburgh, Pennsylvania. The 3 C. denomination stamp shown above (Sc. #1095) was issued on August 15, 1957 to celebrate the 350th Anniversary of Shipbuilding in America. The design features the Virginia of Sagadahock and the seal of the State of Maine. The Virginia or Virginia of Sagadahoc was a masted vessel, built by the colonists at the Popham Colony near present day Phippsburg, Maine in 1607. The 3 C. denomination stamp shown above (Sc. #1105) was issued on April 28, 1958 to commemorate the 200th Anniversary of the Birth of James Monroe. James Monroe (1758-1831) was the 5th President of the United States (1817-1825), and the last President that was one of the Founding Fathers of the United States. Aside from being a two-term President of the United States, during his life, he was a Major in the Continental Army during the Revolutionary War, a delegate to the Continental Congress, a delegate to the Constitutional Convention, the Governor of Virginia, United States Senator from Virginia, Minister to France (negotiating the Louisiana Purchase), Minister to the United Kingdom, U.S. Secretary of State, and the U.S. Secretary of War. The 4 C. denomination stamp shown above (Sc. #1121) was issued on October 16, 1958 to celebrate the 200th Anniversary of the Birth of Noah Webster. Noah Webster (1758-1843) was an American lexicographer, textbook pioneer, political writer, editor, and author. He has often been referred to as the Father of American Scholarship and Education. The 4 C. denomination stamp shown above (Sc. #1122) was issued on October 27, 1958 to publicize Forest Conservation and to celebrate the 100th Anniversary of the Birth of President Theodore Roosevelt (1858-1919), a leading forest conservationist and the founder of the U.S. National Park system. The design features a forest scene.